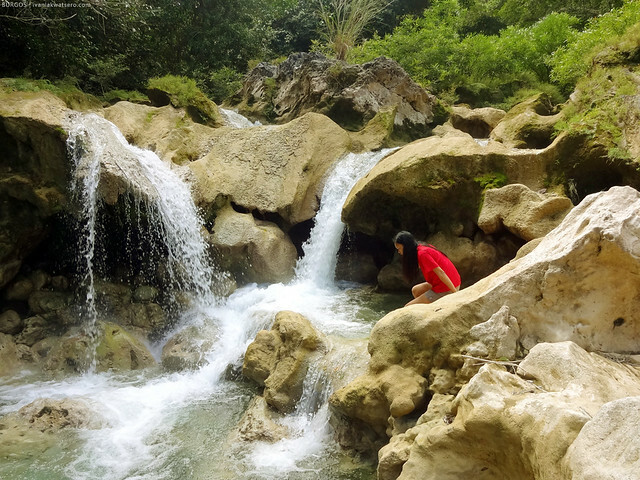 This waterfall adventure is part of my 2014 Ilocos Birthday Trip. I just decided to create a separate post for this because it deserves one. Click in this link to read our Ilocos Birthday Adventure. Gems of Burgos and Bangui. 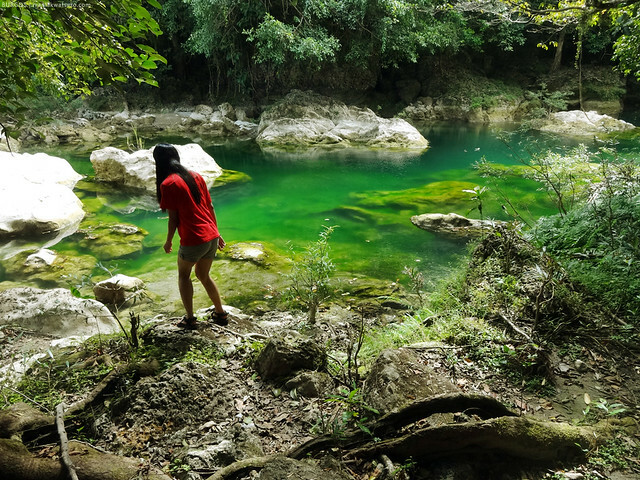 Being the nearest and most accessible of them all, we opted Tanap-Avis Falls from a handful of waterfalls being featured in Burgos town's tourism brochure. 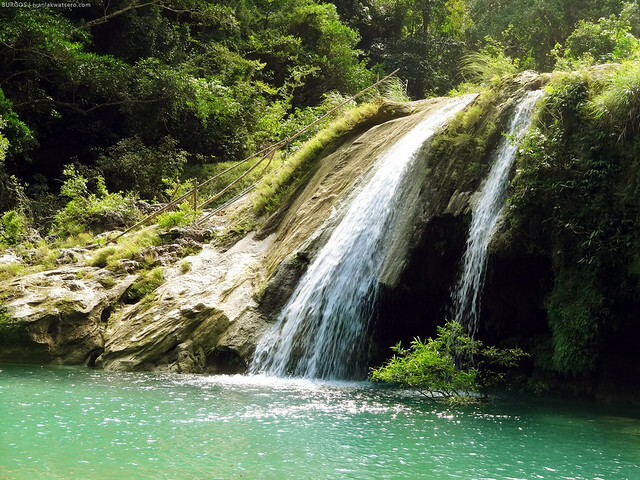 I never heard nor saw this destination from any sources so I was only basing my prejudices of this waterfall from the brief description and a nice image found in the brochure. Located at Brgy. Tanap, we took a tricycle ride from the Municipio to the jump-off. 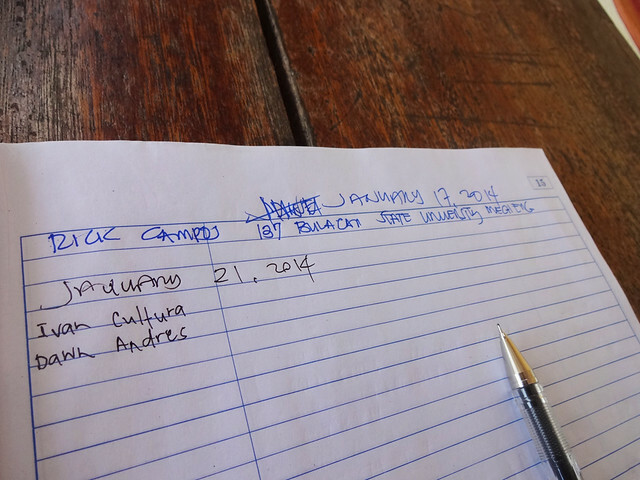 We stopped by a barangay hall to log in. The curious me browsed through the log book and found out that we were the only visitors for the past few weeks. Parang last last month pa yung huling bumisita sa waterfall. It just shows that the place is quite unpopular, which, for me, is a good thing actually. Based from my experience, those well known places (I'm speaking not only about waterfalls, but travel destinations in general) are usually populous, littered, or developed, far from the clean, peaceful, and unspoiled characteristics of the lesser known destinations which I truly favor more. So far so good. Hindi ko pa nakikita yung waterfall pero sobrang ganda na ng impression ko sa kanya. It took us about 30 mins on a tricycle, from the town center all the way to the trail head which is a located inside a mango farm. Yup, there's still some trekking (more or less 30 mins, depende sa pace) involved in order to see the beauty of the waterfalls. At first, we followed an easy straightforward trail. Although it was quite overgrown since no one has used it for some time. 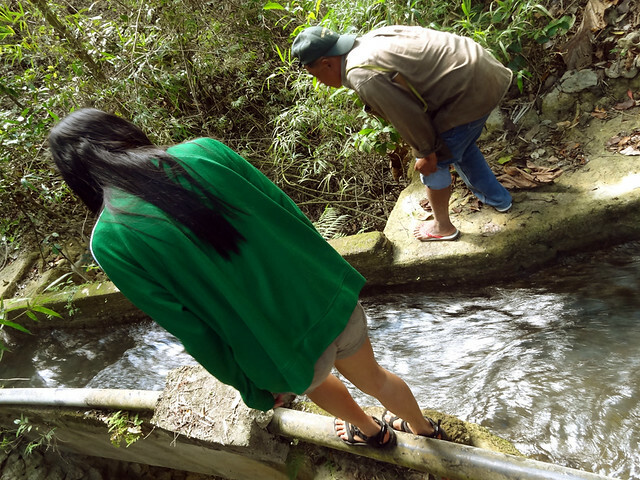 Then, when we hit the man-made water system, we just followed upstream. Following this waterway, we reached the source easily. We were guided by Kuya ?? (I fogot his name). By the way, he's also the tricycle driver that drove us all the way to the trail head. I regret not getting his name or his contact. He's a friendly tour guide slash tricycle service in this trip. 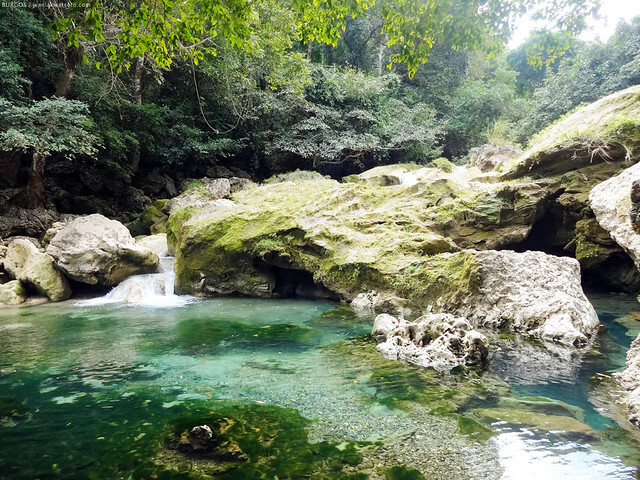 Round trip from Municipio plus guideship to the falls costs P300 only. Somehow and somewhere along the way, I dropped all my expectations about the place. Sabi ko sa sarili ko, hndi ako manghihinayang kung aalisin ko ang mga expectations. I might end up very disappointed if I expect too much. Kaya naman, it was totally a Bahala-na-si-Batman. To my amazement, a very dazzling place came to sight. I was left with no word. The place is enchanting! I believe it was algal bloom that gives it that color. This happens when there's an accumulation of nutrients in a body of water (usually stagnant) and then promotes the growth of certain algal species. That greenish body of water is actually the main catch basin of Tanap-Avis Falls, which is made of a series of water cascades. as per our guide, simula pa lang daw yun. There are more sights to behold further up. So we continued. Following the concrete pathway, we came to another layer of waterfall. This time, the water is clearer, colder, and the current has gone stronger. Honestly, I thought it was already the waterfall we were aiming for... but nope, not just yet. We jumped in to the pool that's too cold and super duper clean. 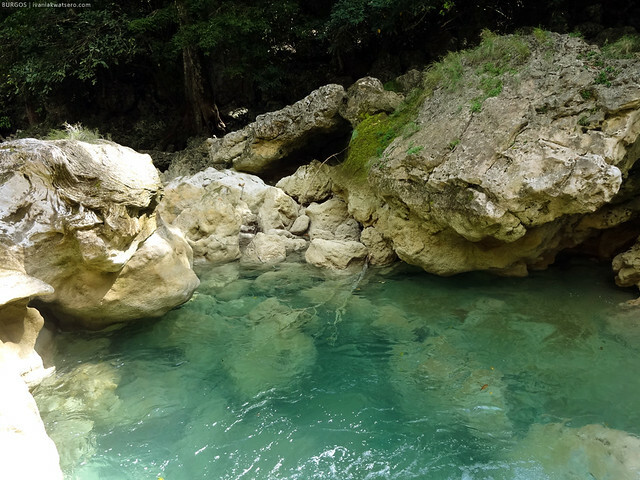 The water was so clean you can bottle it away and sell it the price of commercially available bottled mineral water. 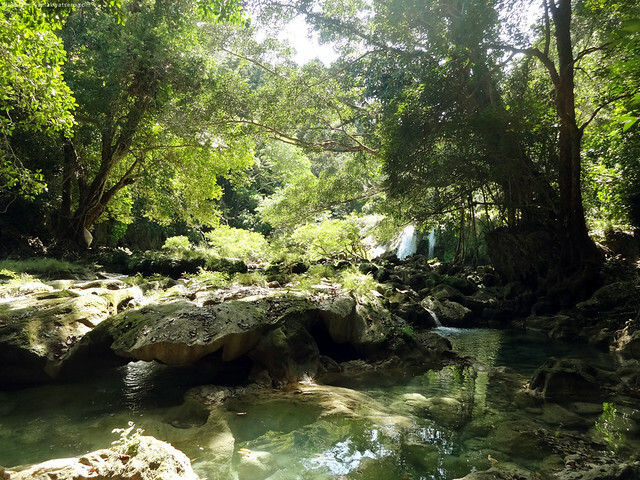 We stayed for like 10 or 15 minutes in this pool of the Nereids, just relaxed there, making most of our limited time in Ilocos. 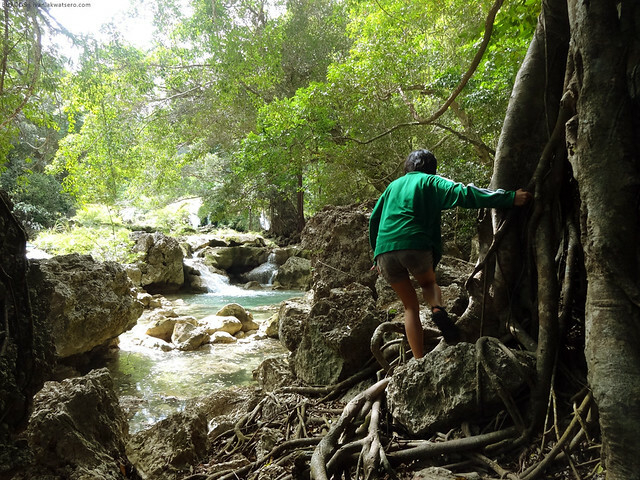 Anyway, we carried on towards the next waterfall having heard that it's the best part of the adventure. Just look at how serene and pristine the place is. Dito pa lang, paulit-ulit ko nang sinasabi sa sarili ko na this visit is all worth it! And then finally, when we got to see the full view of the main falls, the both of were more or less speechless. Our guide delightfully invited us to go up the source of this water falls. He said we can dive off the cliff if we want to. Sumunod din naman kami kahit wala akong plano tumalon, I can't swim you know. Kung marunong lang ako lumangoy, nako! At dahil nga hindi na kami mapatalon ni kuya, we just decided to leave the place to move on to our next destination. You know, a long busy day was still ahead of us in Day 2 of our Ilocos Adventure. 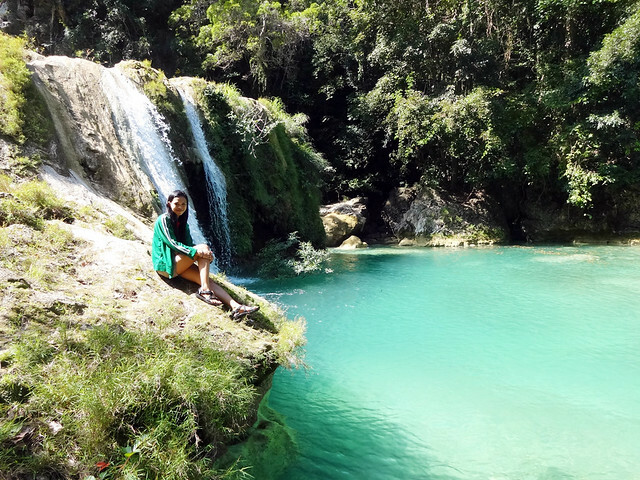 This Tanap-Avis Falls experience is one of my most favorite waterfall trips in my entire life, really! 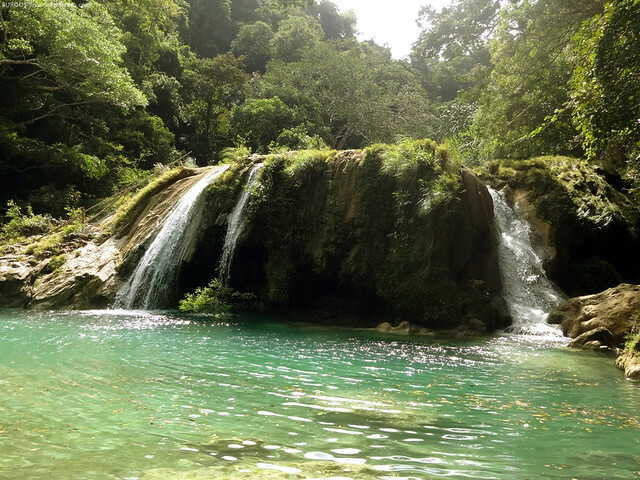 Even though we weren't able to take a cliff dive, we're still very happy and completely satisfied with this waterfalls. 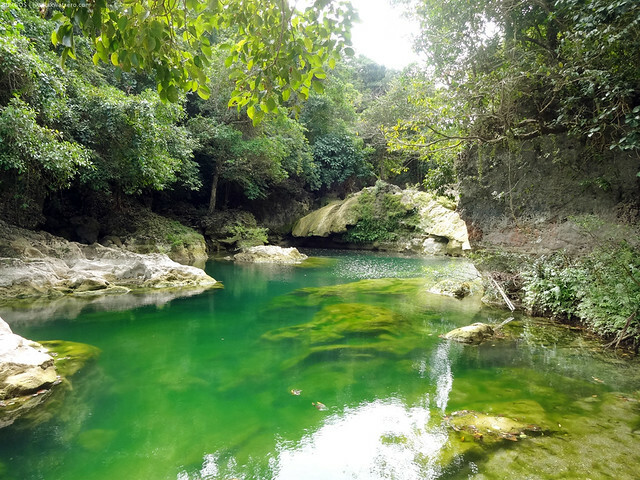 Honestly, the mere trail experience, and of course, the stunning waterscape we just went were a total worthwhile experience. The best ito! Our biggest thanks to our tricycle driver slash tour guide in this leg of our trip. Muchas gracias! You are an avid mountain and an outdoor adventurer, you should really learn how to swim. 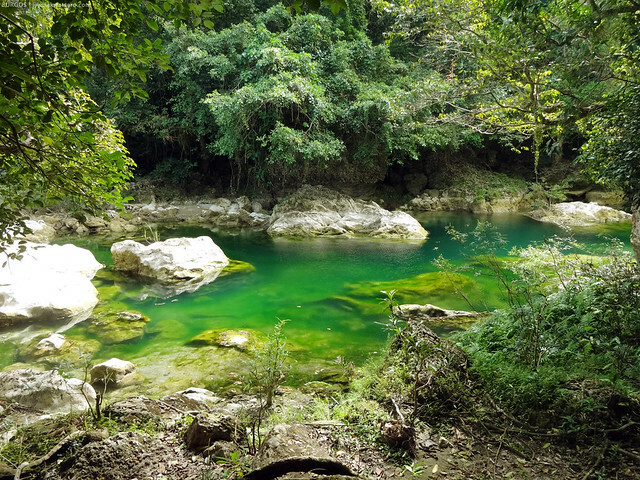 Philippines boasts a variety of stunning travel destination places. They are countless and you have just to see it for yourself to know how beautiful and natural they are. is this a "Tanap Avis" view of 2015?? Ang ganda! Kailangan ba meron tour guide ang meron ba bayad? Salamat! is this near kapurpurawan rock formation?